A seasonal addition to keep you fresh all through summer, flavoured by crisp cucumber, refreshing green tea, and local botanical mit pelargonium. Theonista originally created this blend as a once-off batch for a local Cape Town bar, but being so delicious decided it just had to be shared wider. 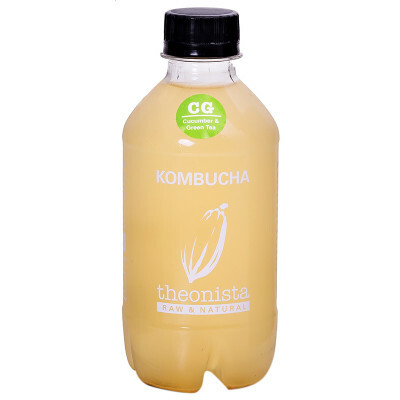 Beyond being a yummy refreshment, Theonista Kombucha is a rich source of probiotics and digestive enzymes that help to keep your whole system in balance, leaving you feeling revitalised and invigorated. Theonista kombucha is raw and additive-free, preservative free, flavourant-free and colourant-free. Organic, local, and seasonal sourcing. 100% recyclable PET bottles are not only foodgrade but also certified BPA and phthalate free. 100% food waste is composted, 100% of kombucha boxes are reused/repurposed. Please note that small clumps or sediment may form in your raw, living kombucha; this is normal. You can strain your kombucha if you prefer a smoother drink, or give the bottle a gentle shake to mix it up (just be careful when opening a shaken bottle)! Kombucha is natural and healthy, but because of its potency we wouldn’t recommend it for pregnant women, or children under 12, without guidance from a health care professional. There is no established recommended daily intake amount for kombucha; it is suggested that 250-500ml per day is a good amount.